“Hey, Rocko — what’s the name of that set of ankles at the desk in the D.A.’s office? You know, the one who’s been sore at me ever since I busted her ma for pushin’ hop. Doris? Dorcas? Doreen? Ah, okay — Ada. Well, lemme run by you my idea to make Ada sweet on me like she yoosta. I assume you recall that stash of gum that Lou and Maloney found in that Jamaican candy store that turned out to be a dopehouse. Here’s what I say: We ask ol’ angelface Ada to pose for the news hawks tomorrow afternoon and finally yank that sour look off that button of hers. Yeah, see? It’s the ol’ gooseberry lay. Tell her that she needs to go out, find a fancy new set of rags to pin on, get her hair done like Betty Grable and then show ever shamoo in Los Angeles how greats she looks. 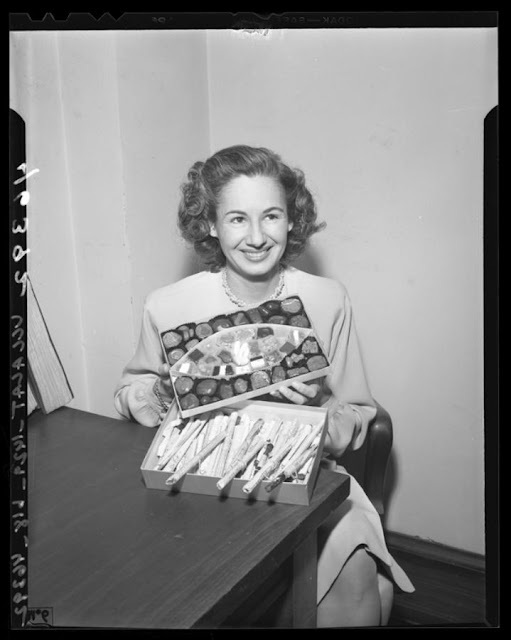 I even got the lined picked out: ‘That’s some fancy candies you got there, but they’re not half as sweet as you, Doris.’ What’s that? Oh yeah — Ada. I enjoyed this very much. You're the best.